Cartouche Maker is a program designed for use in the windows environment and is compatible with windows 95,98, 98SE, ME, NT and XP. 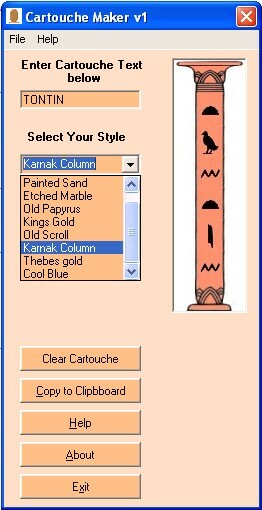 Cartouche Maker was developed using Visual Basic 6 and therefore needs the VB run time to work. 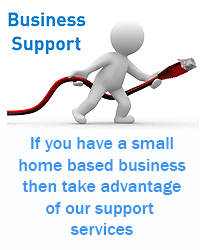 All graphics were created using Ulead's Photo Impact 6. This help file was created using Help Scribble. I have always had an interest in Egyptology and Cartouche Maker is just an expression of that interest. It just seemed a neat idea. A little bit of searching found some online cartouche creators but they were all very bland and boring so Cartouche Maker was created. 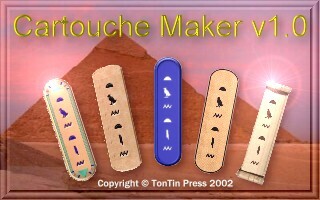 Why is Cartouche Maker v1.0 freeware? 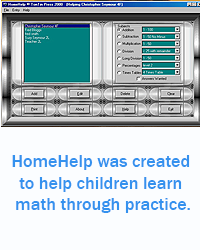 I decided that this program was made to be of use to anybody like me who needed it. I hate pulling down a program from the net after whetting my appetite with a lovely description just to find out that it is disabled or has nag screens. 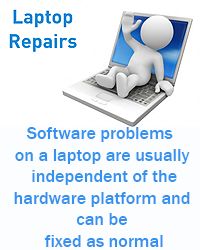 Apart from that if this software is free then more people will use it. TonTin hold's' the copyright to Cartouche Maker v1.0 and strictly forbid the use or inclusion of it in a commercial or profit making situation without prior consent. Usage of Cartouche Maker is acceptance of these terms.